NEW YORK -- Devouring a McDonald's (MCD) Big Mac or a Chipotle (CMG) burrito is on a fast-track to becoming a luxury for many U.S. consumers. It's not as crazy as it sounds, given the surging costs for beef and, above all else, hourly workers. In May, San Francisco joined the city of Oakland in having the highest minimum wage in the nation at $12.25 an hour. Minimum wages in San Francisco will reach $15 an hour by 2018. These hikes have led to recent price increases at Chipotle of 10 percent in San Francisco and 7 percent in Oakland. "In San Francisco, our occupancy costs are about double the Chipotle average as a percentage of sales, and our menu prices there [were] right around the average for Chipotle restaurants around the country, so increases to wages can have a greater impact than they might elsewhere," Chipotle spokesman Chris Arnold said in an email. Occupancy costs are the expenses related to doing business in a location, including charges for rent, electricity and water. On its second-quarter earnings call Tuesday, however, Chipotle noted that "just because the minimum wage increases, doesn't mean we will raise prices." According to the company, it doesn't plan to lift prices at all in Chicago this year due to higher minimum wages, and it will continue to look at menu-price increases related to higher worker wages on a "market-by-market basis." Also not helping Chipotle's profit line is the precipitous rise in the cost of beef, especially for the type of beef that meets the chain's rigorous breeding standards. Subsequently, Chipotle has estimated that it will have to raise prices nationwide later this year to compensate for beef price inflation. The anticipated hike is in the range of 4 percent to 6 percent. "We're just not charging the going rate," Chipotle CFO John Hartung said on the company's first-quarter earnings call April 21. "We actually lose money anytime somebody comes in thinking about getting chicken and instead gets steak, for example, so we'd like to fix that." 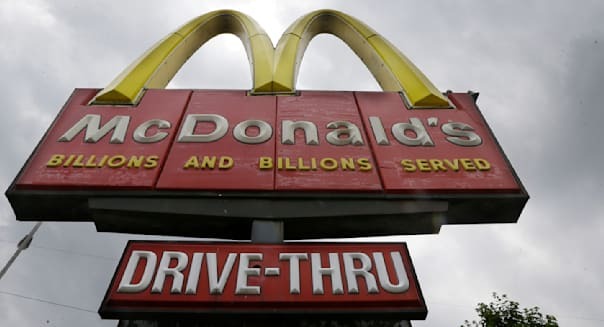 Embattled McDonald's is also feeling the squeeze on its profits, in large part due to minimum-wage increases that went into effect in a number of cities at the beginning of 2015. Similar to Chipotle, the Golden Arches is considering price increases to protect its profits. "The minimum-wage cost, as well as all other costs, certainly impact how we look at pricing," McDonald's CFO Kevin Ozan said on the company's April 22 earnings call. The wage increase will impact McDonald's margins in the "near term," Ozan said, something investors will surely be on the lookout for when the company reports its second quarter earnings Thursday morning. One of the other inflationary costs for McDonald's is ground beef, whose price has skyrocketed in the past five years. Droughts in Texas, California and other cattle-producing areas have hindered the development of livestock. According to the Bureau of Labor Statistics, the price per pound for ground beef hit $4.22 in June, up a whopping 76 percent from June 2010. Ground beef prices have remained stable since the start of this year. Now both Chipotle and McDonald's, along with fast food competitors such as Burger King (QSR) and Yum Brands (YUM), are staring down the barrel of another loaded gun -- namely, a possible spike in the minimum wage for fast-food workers in the populous state of New York. According to The Wall Street Journal, New York State's wage board is expected Wednesday to recommend raising the minimum wage for fast-food workers to $15 an hour. New York's current minimum wage is $8.75, and it is poised to increase to $9 at the end of the year. Such a big spike to hourly wages could deal a major blow to the franchisees that operate in the state, causing well-established brands such as Dunkin' Donuts (DNKN) and McDonald's to drastically boost prices on food and possibly to reconsider their expansion plans. For the very smallest of the fast-food operators in New York, it could force them right out of business in a state already known for high occupancy costs. Should the wage board approve the hourly pay increase on entities it sees as "fast-food" companies, it could also be the first step for a broader pay hike for restaurant industry workers. Workers not in the fast-food business, but instead in traditional dining, often receive what is known as tip wages, which are usually below the minimum wage rate. Tip wages were already rising before the latest move by Cuomo. In February, New York approved an increase in the minimum wage for tipped workers in the hospitality industry to $7.50 from $5. Restaurants will have to enact the order by the end of the year. "It's catastrophic, quite frankly," Applebee's owner-operator Zane Tankel said in an interview with TheStreet, referring to the mandated increase in wages. According to Tankel, the government's push to better compensate fast food workers, and the restaurant industry workforce at large, could lead to "substantially" higher prices for consumers and possibly to service charges. It could also lead to the use of more tablet technology to wait on guests, thereby reducing the number of human workers needed but also raising the prospect of mishandled orders, Tankel said.